There’s nothing like a hot and vibrant setting for a fun crime-caper that makes perfect summer reading. And if it's set in the extraordinary and colourful city of Mumbai, even better. 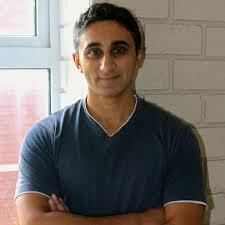 So we're hoping that the heat will have well and truly risen ahead of Monday 23 May, when we welcome hot new crime fiction author Vaseem Khan to Mostly Books to talk about ‘The Perplexing Theft of the Jewel in the Crown’. Vassem’s debut ‘The Unexpected Inheritance of Inspector Chopra’ was one of the biggest crime fiction debuts of last year and became a bestseller. It introduced us to retired police inspector Ashwin Chopra (and his slightly grumpy baby elephant, Ganesha). When Inspector Chopra has to retire from the police, he sets up a restaurant. But soon his reputation as a policeman of integrity leads to demands for him to take on cases of his own and he founds his own private detective agency. 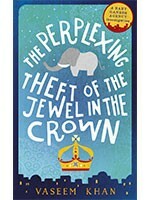 In the just-published second title, ‘The Perplexing Theft of the Jewel in the Crown’ Inspector Chopra has to put aside some of his regular jobs (following missing or misbehaving husbands and the case of the elite school where he has been called in to discreetly sort out cheating), because the city is in crisis. The world’s most valuable diamond is stolen from under the noses of the police when the British Crown Jewels make a visit to India. And when Inspector Chopra’s former colleague is accused of the crime, he knows enough of the country’s police system to know he will be leaving his friend to the brutalities of a life in jail if he cannot find how the brilliantly clever and well-executed theft was brought off. He will probably do it with some help and inspiration from his pet elephant, Ganesha, who was mysteriously left to him by an uncle. As well as a likeable detective with a colourful home life and a passion for justice, this series bring the rich world of modern India to life with all its corruption, incredible poverty and wealth, side by side, all being swept along by massive social change. Good contemporary crime fiction gives a great platform to take a subtle look at society and the current issues that concern us. Vaseem Khan is ideally placed to write a crime story set in modern-day India where youngsters increasingly look to the west for their views on culture and drive their ideas of careers and where wealth often means you can escape justice. Vaseem was born in Britain to parents who had emigrated to Britain from Pakistan and who were not best pleased when he decided to seek a career in India. But he returned to London and works at the Department of Security and Crime Science at University College London managing research projects into crime science. The series bears comparison to the hugely successful and popular ‘No 1 Ladies Detective Agency’ – and anyone who warms to crimes in sunnier climes rather than the Nordic chillers, will find plenty to intrigue and enjoy. Vaseem will be in conversation with Mark Thornton at Mostly Books on Monday, May 23 at 7pm. Tickets are £4, and refreshments will feature a definite Indian theme. Email to reserve your ticket for what we hope will be an entertaining evening with a bright new writing talent.